I have created an example above so that you can see why HIGH AND WIDE is so important when hanging curtains. 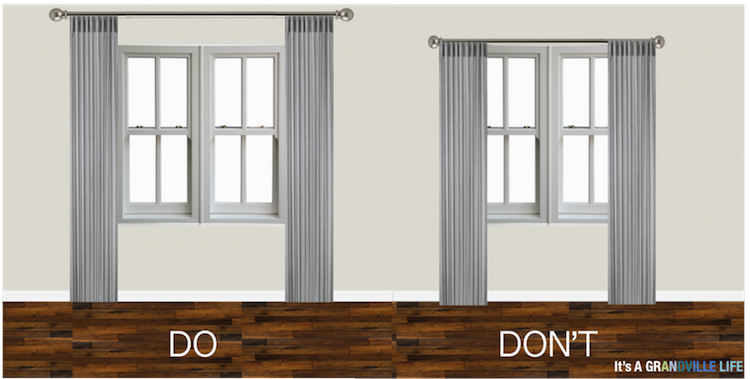 In the right image above, better known as the "DON'T" version, the curtain rod is hung right above the window and extends only width of the window. By having the rod extending only the width of the window, the curtains end up covering part of the window, making it look a lot smaller. Having the rod hung so low on the wall also makes the window look smaller as well as makes the ceiling height appear lower. The HIGH AND WIDE example, also known as the "DO" version, has the rod hung inches above the window and is extended wider than the window making the window look larger and the ceiling height appear taller. When we moved into the house, the previous homeowners had left brown curtains in the living room (as seen in the before photo). 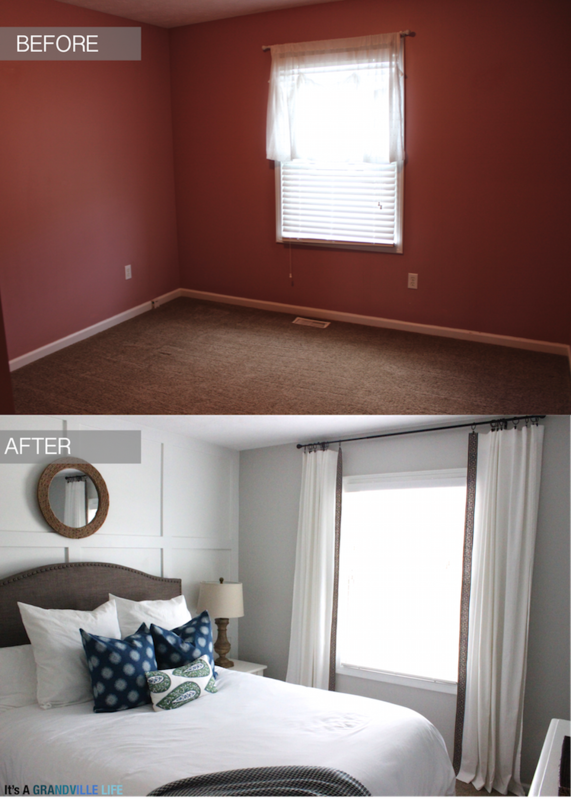 The curtains weren't covering up the window, which was a good thing, but the curtain rod height was too low and was shortening the appearance of that wall and ceiling height and was taking away from the cathedral ceilings. In order to fix this, I bet you can guess, I hung the curtain high and wide. I didn't hang the curtains as wide as I would normally like, but I wanted to be able to fit in the bookcase and a piece of artwork so I hung it the bar a little less wide and condensed my curtains more together to accommodate the other things. If I were to take the curtains down, though, you would still see that the curtain rod is extended beyond the width of the window. Is anyone else in disbelief that this is the same room? When I was putting this image together last night I couldn't believe how much taller the ceilings look and how much bigger the window appears just from the curtains alone. I'm telling you the HIGH and WIDE formula does wonders. So what exactly is the HIGH and WIDE formula? Just like everything else in design, there isn't just one formula, or this case measurements, to use. 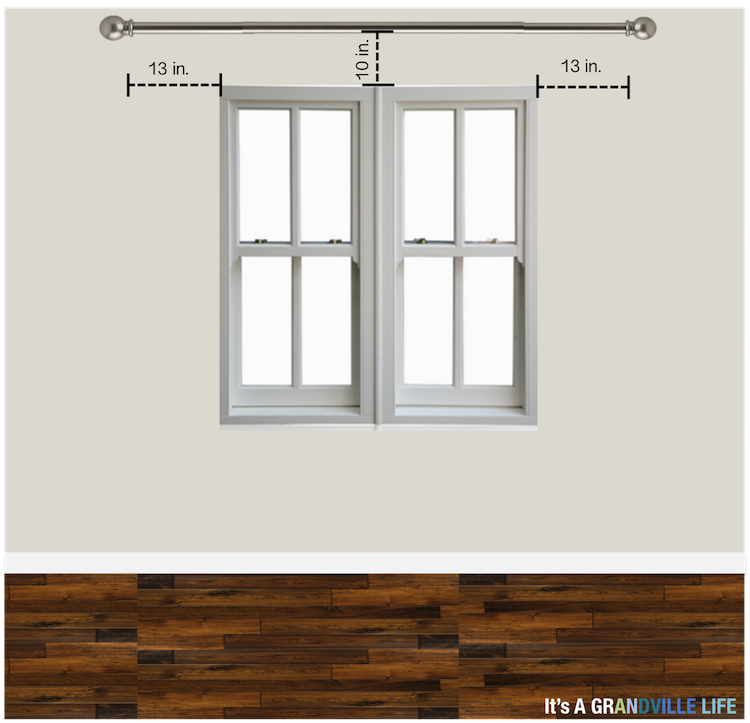 Since the examples I provided were from our home, I thought I would provide the measurements that I used, but you can modify them to meet your home and window needs. In my guest bedroom, the rod was hung 10 inches above the window and 13 inches beyond the window on both sides (not including the width of the end cap ball since the curtain can't hang on that part of the bar). How wide the rod extends beyond the window is really going to depend on how compact you want your curtains to hang. The more compact the curtain, the narrower this distance has to be, but make sure that the curtain isn't covering the window and rather is starting at the outer border frame of the window. How high the rod is hung above the window can also change based on ceiling height, personal preference, and the curtains you use. 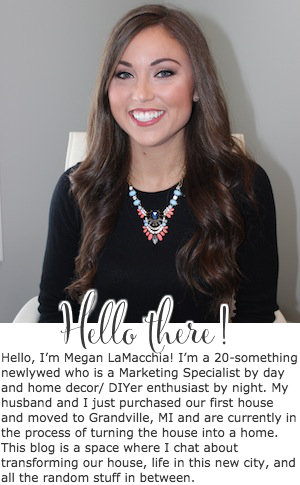 I was able to hang my curtains 10 inches above the window because I made my curtains custom-length using these curtains and my no-sew tutorial (read here). If you buy curtains from the store, like I did in my kitchen from HomeGoods, you can buy the 96 inch length and hang the curtain bar at the top of your wall if they are 8 ft. wall. 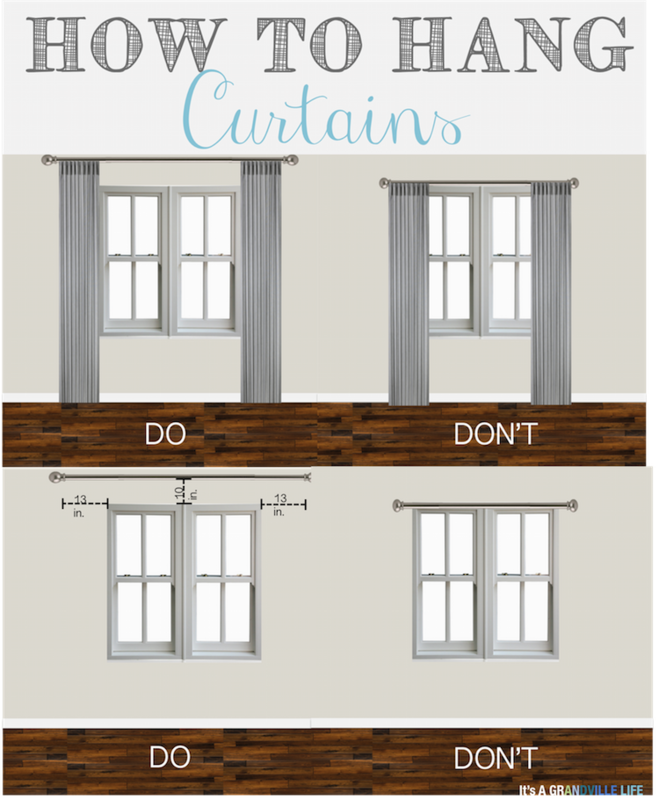 I hope these tips make you feel more confident next time you decide to hang curtains!! Let me know in the comment section below if you have any questions, as well as if you have any requests/ideas for future segments on this series! Such a helpful post! 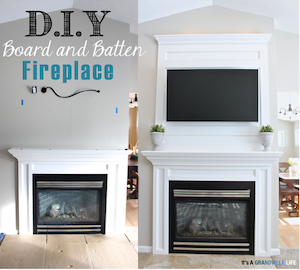 Love your before & afters, you really have an eye for design... Which made me especially excited that you shared your favorite curtains at the end :) thank you! This was just what I needed! Thank you for writing this up. #highandwide !! This small touch has really big impact on a house and how big it feels. This is one of the first things I recommend to those looking to sell their homes. I have baseboard hot water heaters under several windows that i need to dress, what is your suggestion for these. Does this work when window woodwork is 10" or more? What would you recommend?? My living room has two french doors, with just the one on the right, opening up to a small "juliet balcony". Then right next to the doors, on the left side, is a window. Should I hang curtains on either side of my doors? Or on either side of the window, or hang them across the window & the doors? Why mount it that high, it shows so much WALL between the window and the rod. It looks like a chick with an giant forehead. Why not keep it tight?? You should really split the difference between the ceiling and the top of the window. So if you have 20 inches of wall from the top of the window to the ceiling, then you would hand the rod at 10in above the window. You're curtains aren't even over the window. That makes them not curtains, more like TAPESTRIES. Hello. I am trying to figure out how to hang curtains in my bedroom which are in a little nook. There are 4 windows in a square that span about 78 inches across including the wooden trim that meets the side walls. so there is no room to hang curtains wide so how should I go about hanging them? Thanks! 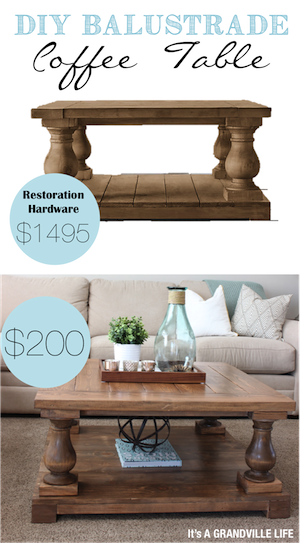 I'm writing a post on how to create a dream bedroom on a budget over at RenovatedFaith.com. I was wondering if I could use your curtain diagram and of course link back to your post. Let me know your thoughts. Hello. I have 8 ft. ceilings. I love long curtains. 95 inches. I hung my rods as close to the ceiling as possible. The rod hangs about 8 inches above the window trim. Is this too high? Does anyone know the length of the rod used here or the size of this window? I probably missed that info.